This ballgown wedding dress with intricate open back from designer Stella York was made for the princess bride! 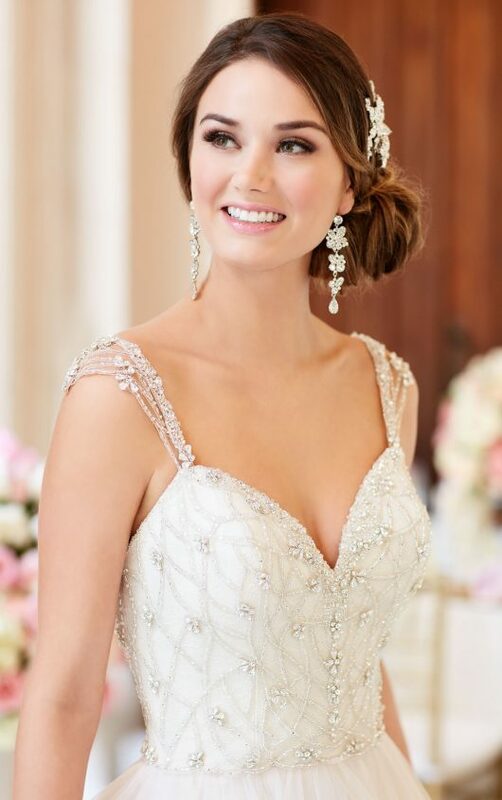 Diamante beading covers the bodice and straps, while an intricate beaded pattern over illusion tulle covers the open back. The sparkling jewels create a delicate and dazzling pattern that catches the eye. The skirt is made of layers of horsehair hemline tulle that is billowy and romantic. It flows down from the open back and waist, creating the ballgown silhouette. Lace is lined with the same intricate beadwork as the back and is embellished with careful attention to detail. This backless wedding dress zips up sparkling signature Stella crystal buttons for an extra pop of glam!